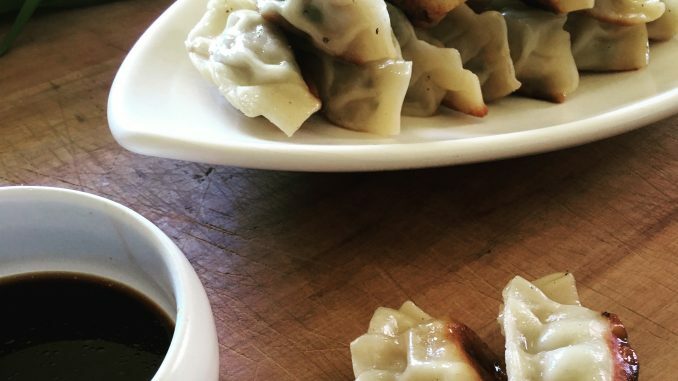 Making something from scratch is always so rewarding — and these little pot stickers are much easier than they look. Traditionally called Jiaozi, these dumplings can be steamed, boiled, deep fried or pan-fried like the Japanese Gyoza. I absolutely love them pan-fried as it’s the best of both worlds — soft and juicy on the inside, and crisp and golden on the base. They’re perfect for tucking into as an appetizer for a dinner party, or as a meal for the family served with a simple side of Asian greens. Place the chicken, pork, garlic, ginger, coriander, shallots, sauces and sesame oil in a large bowl. Using clean hands, mix well to combine. Place gow gee wrappers on a clean board. Place two level teaspoons of mixture in the centre of each wrapper, and brush the edges with a little water. Fold over to enclose filling, removing any air from the dumpling. Pinch pleats along the edge to seal. Repeat with remaining wrappers and filling, placing finished dumplings on a baking tray lined with baking paper to avoid sticking. Heat 2 teaspoons of peanut oil in a frying pan over medium heat. Cook dumplings in a single layer for a few minutes, or until the bases are golden brown. Add enough water to the pan to come 1cm up the side. Cover and cook for 6-8 minutes or until dumplings are cooked through. For the dipping sauce, simply combine all ingredients together in a bowl. Transfer the dumplings with a slotted spoon to a serving plate and serve with the dipping sauce. Freezer tip: Place any uncooked dumplings in the freezer on the lined baking tray. Once frozen, transfer to a freezer bag and store for up to a month. When you use frozen dumplings, do not defrost. Cook directly from frozen and steam for extra 1-2 minutes.